About a year ago, my astronomy buddies and I made plans to observe the 2017 Total Solar Eclipse that tracks across the USA from Oregon on August 21, 2017. Some of our group decided to head for the desert of Central Oregon, but a few of us decide to stay in the Willamette Valley near Salem in the I-5 corridor. I made reservations at a hotel in Newburg, which is just outside the track of totality, and others used Air BnB to book accommodation inside the track of totality. 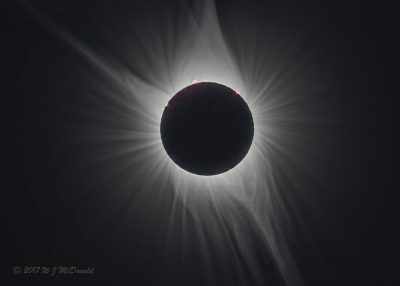 I also picked the Western Oregon University campus in the small town of Monmouth, Oregon as our meeting place, since it is very close to the centreline of totality for this eclipse. I’m not much for road trips, so I keep the trip as stress-free as possible by taking two days to drive down to Oregon and taking two days to drive back home. I stay two nights in Newberg in order to minimize driving in the inevitable traffic congestion that will happen around eclipse day. 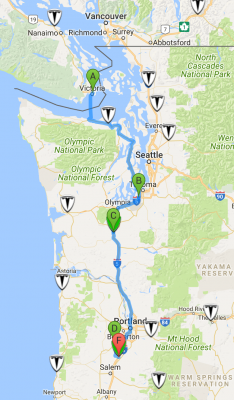 I stay at a hotel in Lakewood, Washington as the mid-point on the way down, and overnight in an historic hotel in Centralia, Washington on the way back home. My full itinerary is listed below. Feel free to click on what interests you, however if you click on the top-most item, there are links at the bottom of each page (just above the Comments section) to take you to the next destination – from beginning to end. This is the best way to explore the whole trip as it happened. The whole trip covers some 1,100 kms, and my Tesla Model S consumes some 200 kWh of electricity at a rate of 179 w/hr. Running cost of the car is negligible since I recharge at no cost using Tesla’s Superchargers for most of the trip. The only significant expenses are hotels. the ferry fare and a few meals – totalling well under $1,000 or less than $200/day.